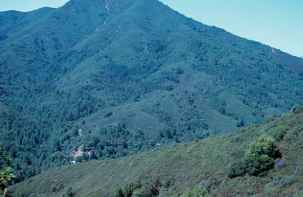 Figure 1 Chaparral shrubland in California. Photo by J. E. Keeley. arid sites at lower elevations evergreen chaparral is replaced with a lower-stature summer deciduous 'soft chaparral' or sage scrub. Chaparral owes much of its character to the Mediterranean climate of winter rain and summer drought. The severe summer drought, often lasting 6 months or more, inhibits tree growth and enforces the shrub growth form. Intense winter rains coincide with moderate temperatures that allow for rapid plant growth, producing dense shrublands. These factors combine to make this one of the most fire-prone ecosystems in the world. This Mediterranean climate is the result of a subtropical high-pressure cell that forms over the Pacific Ocean. During the summer, this air mass moves northward and blocks water-laden air masses from reaching land, and in winter this high-pressure cell moves toward the equator and allows winter storms to pass onto land. On the Pacific Coast it is wettest in the north, where the effect of the Pacific High is least, and becomes progressively drier to the south, and consequently chaparral dominates more of the landscape in the southern part. Interestingly, these synoptic weather conditions form globally at this same latitude (30-38° north or south) and on the western sides of continents. As a result similar Mediterranean-climate shrublands occur in the Mediterranean Basin of Europe, central Chile, South Africa, and southern Australia.